The Essex Green EP followed their debut LP by a few months, but it's unfortunately a little bit of a step back. I think the band wanted to make their music more contemporary-sounding, but to do that they sacrificed one of their strengths by clearing up the haze in their productions. They also managed to accentuate one of their weaknesses as the vocals here are completely rooted in 90's indie rock, unfortunately destroying the illusion of a quality 60's psych pop disc as they managed on about half of their debut LP. But let's not stay negative; there is some fine material here. The standout by far is the opening track "Fabulous Day." Although my complaint about the vocals remain, it's not too bad here and the song is extremely well written. The psychedelic slithering of the instruments in the tracks is quite enjoyable to behold. "Trees" isn't too bad either, but "Chester" make me want to vomit my Lucky Charms, and "New Orleans" is a B-list cosmic country rock track that doesn't hold a candle to Gram Parsons (or Beachwood Sparks, who manage a good cosmic country sound contemporary to the Essex Green). We finally get some worthwhile sounds with the probing "Bald," although the songwriting is nowhere near the quality of the first track. Basically, I would only give "Fabulous Day" a full thumbs up for your discerning attention. You really need to hear Everything Is Green first. But if you are in fact having a fabulous day, then this bite-sized chunk of music may rub you the right way. The Essex Green are another group of neo-psych rockers affiliated with the Elephant 6 recording collective. Their specialty is refracting pastoral acid folk through a psych pop prism, and they're not too bad at the job. At their best the recordings osund like they could have come straight out of Joe Boyd's studio around 1968, although the Essex Green does have the occasional nasty tendency to revert to 90's indie rock cliches, especially in terms of the vocals (for example the cutesy female vocals on "The Playground"). Fortunately, the cover art does a great job of implanting a psychological suggestion that you're holding onto the real deal. This looks about right sitting next to an ISB or Stone Poneys album. Truth be told, I originally bought this about eight years ago based pretty much on the cover art. Although a few things here do make me cringe, let's look at the highlights. "Primrose" is a very convincing amped-up acid folk track, and would probably sit unnoticed on a Nuggets-type compilation, despite being recorded about 30 years off the mark. "Grass" is a very hazy, atmospheric folk dirge that leaves no question about what kind of grass they're referring to. I especially dig the slightly phased vocals. "Tinker" is the only extended track here, and it recalls one of the better bands that you'd hear pounding away on some forlorn stage in a 60's psychedelic exploitation film. 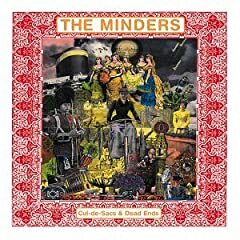 "Sixties" works well musically musically with its folk-rock-with-sitars sound, but the lyrics on this one are a touch cringeworthy. Speaking of cringing, "The Playground," "Mrs. Bean," "Saturday," and "The Sun" contain too much sugar for my soul. These are also the tracks where the vocals end up sounding like an anachronism. This particularly scars "The Sun," which I want to like but just don't. This is a very pleasurable, if flawed album. 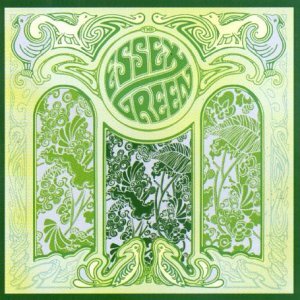 For the most part the Essex Green aims for a pretty convincing retread of the 60's psych-pop scene, but the moments out of character do prevent this one from really doing the job properly. If you want to hear a band do it completely successfully, then I refer you to the Olivia Tremor Control's proper LPs. Still, there are several tracks present here that I wouldn't want to live without, and maybe you'd be a little happier with them in your life too. This is pretty happy music, even when they're trying to be melancholy. 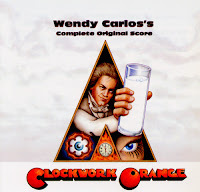 Even before Carlos knew of a film project concerning A Clockwork Orange, the composer had begun work on a composition (Timesteps) based on the book. It's the best piece of music in the score (and one of the most famed in the early history of electronic music), fitting in well next to late-'60s minimalist works by Terry Riley as well as the emerging Tangerine Dream (pre-Phaedra). Carlos also pioneered the effect of synthesized vocals (known as a vocoder), and their eerie nature perfectly complemented scenes from the film. Much of the rest of A Clockwork Orange is filled with rather cloying synthesizer versions of familiar classical pieces (from Beethoven's Ninth Symphony, Purcell's Music for the Funeral of Queen Mary, Rossini's The Thieving Magpie) similar to Carlos' previous Switched-On Bach recordings. Still, it's worthwhile if only for Timesteps. A Clockwork Orange was originally released as a Warner Bros. soundtrack, containing only film cuts (which edited Timesteps down from 13 minutes to only four). Though Carlos released another version with more music, that issue was superseded in 1998 by the release of A Clockwork Orange: Complete Original Score by East Side Digital in the label's comprehensive reissue program. 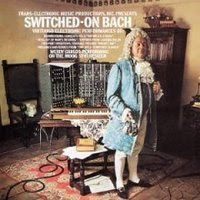 Pressed for a sequel to Switched-On Bach, the unexpectedly hot-selling breakthrough album for the synthesizer, Wendy Carlos temporarily shelved plans to move out of the 18th century and instead came up with an album that is, in some ways, even better than its famous predecessor. Her instrument rack had grown larger and more flexible and her technical abilities even sharper in the year since SOB came out -- and the improvements are audible in the thicker harmonies and more sophisticated timbres, all without losing the zest and experimental zeal of the earlier record. Here, she revisits J.S. Bach and imaginatively translates the music of Monteverdi, Handel, and especially Domenico Scarlatti into the electronic medium. Excerpts from Monteverdi's "Orfeo" and "1610 Vespers" serve as the gateway and closing benediction, respectively, to this collection, and four Scarlatti keyboard sonatas are given dazzling treatments (the sonata in G became well-known in the '90s on a Christmas TV commercial). There is a mini-suite from Handel's "Water Music" at the center of the album, and the densely orchestrated yet still dancing treatment of Bach's "Brandenburg Concerto No. 4" serves as a signpost as to how far Carlos had come in only a year. This late 1968 release seemed innocent enough at the time; and actually, it was a sincere effort to use a then newly-practical interpretive instrument, the Moog synthesizer, in a decidedly traditional musical manner. Indeed, at the time, it was simply extending -- in a somewhat more forward-thinking direction -- the kind of attention that had been devoted to Johann Sebastian Bach's music as early as 1782, barely over 30 years after the composer's death, when Mozart wrote a set of string trio arrangements of some of Bach's keyboard works. Heard 40 years on, the approach here seems very tame and formal, but in 1968 it offended some Baroque purists (of whom there were relatively few) and a lot of classical music Luddites (of whom there were a lot more); but it still became the first classical music LP ever to be certified for a Platinum Record Award, by selling to hundreds of thousands of mostly younger listeners who didn't normally buy classical recordings. 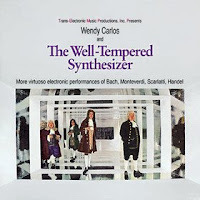 Wendy Carlos had come up with an artistically valid and musically legitimate approach to the most tradition-bound of all classical music that made it not only palatable but exciting to a generation of listeners more inclined toward the Beatles than Beethoven (much less Bach). Carlos' use of the Moog's oscillations, squeaks, drones, chirps, and other sounds was highly musical in ways that ordinary listeners could appreciate, itself a first in the use of this instrument, and was characterized by -- for the time -- amazing sensitivity and finely wrought nuances, in timbre, tone, and expressiveness. Carlos saw the Moog voice as valid on its own terms, which may be one reason why this album still stands out today, when compared with some of the more flamboyant work that followed from others, such as Isao Tomita -- everything here is musical, with no sound effects to speak of until near the finale (and even that is restrained); and the Moog is working in its own "voice," rather than overtly imitating other, non-electronic instruments. Every 'history' is biased and has some kind of ax to grind. The one that Thomas Ziegler and I set out to do was no different. In the summer of 1999, he asked me if I wanted to help him put together a multi-CD set to cover the history of electronic music. I jumped at the chance, having no idea what I was getting into and with zero experience as a producer. After settling down on a year span (the '80's seemed like a time when things really splintered), we then had the pain-staking task of deciding which artists and which pieces should be on it. As detailed in our liners for the release, some legal problems prevented us from including everything that we would have wanted to but in the end, we had 3 CD's with about forty artists, covering some of the most extraordinary composers and visionaries of the last century. A number of other collections had covered one particular time period or region but there wasn't one release that had all of them together in one place. Along with inescapible names like Cage, Eno, Stockhausen, Riley, Reich and Xenakis, I thought it would also be important to include other composers who have made important contribution but might not be as well known, such as Eimert, Lansky, Chowning, Dodge, Le Caine, Maxfield, Parmegiani, Risset and Ussachevsky. 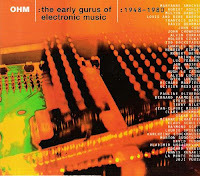 The end result is OHM- The Early Gurus of Electronic Music on Ellipsis Arts (available April 24th). Along with Thomas and the Ellipsis crew, we worked long and hard to contact all of the living composers to get quotes about their pieces as well as find archival essays and photos to go along with comments from artists influenced by these composers. Gruelling as it was, I hope that the end result will be worthwhile to anyone with an interest in electronic music. Sometimes I get the impression that I may be a little dense. Schwingungen is considered a masterpiece, but I just don't see it. Meanwhile, this one is seen as a misstep in an otherwise stellar run of albums. The catch is that I love this one and pretty much see this as Ash Ra Tempel's shining moment as a proper band (I'd still give the top slot to Inventions For Electric Guitar, which is a Manuel Gottsching solo album in all but name). With the revolving door in full swing, we get new drummers and guests appearing here, most notably LSD guru Timothy Leary. He provides vocals for the album. He can't really sing, but he does sound focused, yet demented, which I think perfectly matches the music. The first side of the album is listed as "Space," which is probably a fitting name for any track this band produced. Leary merrily belts out what I would classify as bubblegum blues as the band blasts at full tilt on sections like "Downtown" and "Right Hand Lover." Now this alone would rate the music as an amusing novelty, but these sections are juxtaposed with full-tilt walls of intense psychedelic noise. It's like the band was hired at a party to play some groovy dancing tunes, but are so blasted away on acid (with Leary on board there's no alternative substance-wise) that they keep getting distracted and begin searching for the great cosmic sound of Om. Then they realize their error and return to the bubblegum blues before gleefully losing focus again. It's this disorienting loss of focus that makes "Space" one of my favorite tracks period. Just picture these freaks playing this stuff at a bewildered high school dance and maybe you'll dig it. Side two's "Time" is more Ash Ra Tempel by-the-numbers if such a thing is possible. It's a very chill ambient that lightly recycles themes from the last album and bears a bit of resemblance to Tangerine Dream's Alpha Centauri. This makes sense as Steve Schroyder played organ on both recordings. Leary has a very different role with some strange spoken word vocals often over some beautiful wordless female singing. We don't hear quite so much of Gottsching's guitar on "Time" as is typical, but Ash Ra Tempel was still a proper band at this point, so it's ok. Realistically, "Time" is probably superior musically, but I just can't get over the rush of "Space." But as Einstein theorized, space and time belong together. So I'm going to put this album forth for some serious reassessment. This is about as psychedelic as rock music gets. You really don't need the help of any substances for this one to utterly and completely blow your mind. It doesn't hurt that the cover art is completely dang awesome either. Give it at least two listens. 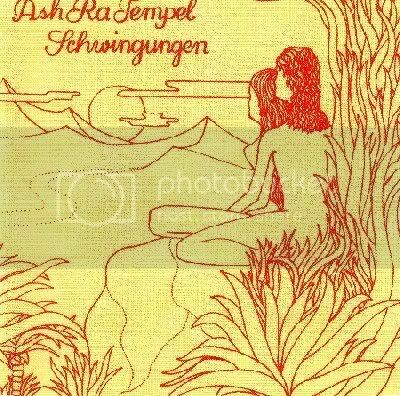 Schwingungen is often cited as Ash Ra Tempel's magnum opus, but I have to admit that it's never really clicked with me. The band remains very experimental, but the have lost the unhinged, going for broke dynamic that makes their debut so appealing to me. One issue might be that Klaus Schultze's drum stool have been filled by Wolfgang Muller. Mr. Muller's certainly not a bad drummer, but he doesn't gel quite as well with Manuel Gottsching's guitar playing. Maybe it's just a function of not having played together for long. Despite my reservations, there are some fine sounds to be heard here. The opening track, however, is by far my least favorite track on any of the early Ash Ra Tempel albums. It's a vocal track called "Light: Look At Your Sun." Vocalist John L.'s warbling quickly gets my hand on the needle to switch to the next track (ok, it's the mp3 player button; I only wish I had some Ash Ra Tempel on vinyl), and the band has blunted their experimental edge by incorporating TOO much song structure and an unwelcome emphasis on blues riffs. I have no problem with blues or song structure, I just prefer these guys without a net. "Darkness: Flowers Much Die" is a huge improvement and by far the best song on the album. The beat builds up over twelve minutes with a metronomic tribal pulse eventually augmented by a wall of bongos. 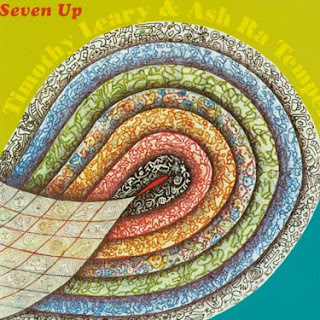 John L. doesn't bother with lyrics on this one, and effectively improvises strange sounds and made up words that would give Can's Damo Suzuki a run for his money. The only other track here is the 20 minute long "Suche and Liebe," which I'm ambivalent about. After a long stretch of vibrophonic ambient sound, the band finally kicks into gear only to sound like contemporary Pink Floyd. Considering the innovative and experimental charge the band manges on the debut and on later albums, sounding like Pink Floyd is a major disappointment. On the positive side, they ape that superstar band pretty well, possibly even bettering that basic template. This is a revered album by many, and I think I'm in the minority seeing this as a step down. I just want to hear something wild when I put on Ash Ra Tempel, and I feel that Schwingungen is too restrained and mannered, not playing to the band's strengths. Even so, it's a solid piece of work by a phenomenal band and the second track is a highlight in the band's discography. With a reputation as one of kraut rock's leading lights, Ash Ra Tempel does not disappoint on their debut LP. The initial line-up of the band includes such luminaries as guitarist Manuel Gottsching (who will turn out to be the band's only mainstay) and drummer Klaus Schultze (who shows up on about half the albums made in Germany during the early 70's on drums or synths). The sound here is pretty much wild, acid-rockin' improvisation, but it's all a cut above the norm as the players still come across as sounding tight as they probe the deeper reaches of cosmic sound. This is a purely instrumental affair, which is probably for the best as words would simply distract us from the onslaught of sound this band whips up over the course of the two tracks present here. "Amboss" is a firestorm which starts of with a strong groove before unhinging the gates of hell in its final few minutes. Gottsching's intense soloing doesn't get old during the 20 minutes stretch as Schultze's relentless pounding goads the guitarist further and further. Things chill out considerably on "Traummachine," where Gottsching's guitar dives into a pool of reverb which anticipates his guitar work in the second half of the 70's, and the percussion is either spread out lightly or entirely absent. It doesn't quite stand up to the intensity and visceral nature of "Amboss," but it remains a wonderful mood setter. Ash Ra Tempel's debut is one of the cornerstones of krautrock. It's presents a gold standard for psychedelic improvisation and retains the power to blast your mind into a distant galaxy. You owe it to yourself to listen to this if you're not already familiar. The Minders were (are?) one of the lesser-known tributaries of the neo-psychedelic hurricane of the Elephant 6 collective. This compilation of singles appeared at the collective late 90's peak (at least in terms of productivity). Frontman Martyn Leaper has a pretty strong way with a melody, and the songs press their way straight through the somewhat low-fi production to present us with tunes that could of found their way to the 1967 hit list. This is not necessarily to say that we're talking about a classic. There are a few dated late-90's indie rock cliches running rampant, especially is the vocal timbres, and Leaper put a little too much sugar into the sonic mix. I'm of the opinion that even the sunniest sunshine pop or psychedelia needs an undercurrent of darkness which we don't really hear on this. I guess this is where the disc shows its true colors as a singles compilation, as we don't get any balancing album tracks. As sugary neo-psych singles go, however, Cul-De-Sacs and Dead Ends is quite a bounty. The songs are of a pretty consistent quality, so your favorites will probably be the ones that forever get stuck in your head. For me "Almost Arms," "Better Things," "Now I Can Smile," and "Waterlooville" just won't leave my brain playlist. Maybe this disc is a little dangerous after all. I have to admit that I was a bigger fan of this disc when I was rollocking around the University of Georgia nine years ago. Now, this album is much like a bag of Twizzlers for me. I enjoy them and can't stop eating them when they're in my hand, but I end up with a stomachache later. This album too will give you a stomachache, especially if you eat it. Oh crap, now "Sally" is stuck in my head too. What we have here is an enjoyable slice of downtempo ambient sounds. Soundtrack (313) is basically a tribute to the wild and wooly hometown of producer Nick Ollivierra. The hook here is that Ollivierra recorded snippets of natural ambient sound and street conversation from within the 313 area code. This is not really taken to any experimental extremes, however, and the real meat here lies in Ollivierra's synth and sequencer sculptures. With the first two tracks setting the mood nicely, "Force" (number three in the track listing) extends the length to nine minutes to frame it's pulsing light industrial sounds and soaring synthesizer pads. "The Inverted Man" constructs a very groovy lattice of synthesized patterns. The beats are generally pretty sparce and subterranean, although the eight minute closer "Shifting Gear" has a suggestion of jungle beats, which were pretty trendy in 1996. The most fitting comparison with this disc would probably be with early Aphex Twin. In fact, the sounds here are like a more hi-fi version of Aphex Twin's Selected Ambient Works 85-92, although Ollivierra doesn't match that album's genius. That's a pretty tall order to match, though, and this album's pleasures are well worth hearing. Here's a slice of pretty obscure German electronica. I don't think it quite fits in with the Berlin school (don't you need lots of sequencers for that? ), but it serves well as an early 80's update of the early Tangerine Dream sound (like Zeit). Rolf Trostel recorded this live in a Spanish cathedral according to the liner notes. This is a very ambient album and I believe we are getting some atmospheric sound from the location, just as Paul Horn used the Taj Mahal as his personal echo chamber. While there are technically five parts to Trostel's piece, I've got it as one long track and it probably makes sense that way. Staying below the surface, Trostel builds layers of synthesized tones. You'll find plenty of evolving pads of sound at work. Of course, that makes this pretty much slightly disconcerting background music, but at least I like to make my apartment an aurally creepy place from time to time. Make sure to wait for the grand finale when Trostel manages to play more than one note every five seconds (along with a bit of sequencing, so maybe this segment is very Berlin School), not that he really needed to for the first forty minutes; this is deep in ambient territory. This is a notable disc of droning, electronic atmospherics. 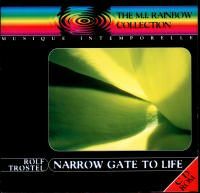 If any music is going to alter the chemicals in your brain, Narrow Gate to Life should do the trick (although not quite as spectacularly as Coil's Time Machines). Dino Valente rates as San Fraciscan, Summer of Love royalty. Among his flower child qualifications are his contribution of the song "Get Together" as part of the hippy lexicon, as well as his involvement founding the Quicksilver Messenger Service. Of course, due to a drug bust he didn't actually record with that band until it was arguably past its prime. This solo album dates from shortly after his release from prison. It's basically psychedelically folksy shambles, but it's far more coherent then the truly unhinged solo releases of Skip Spence or Syd Barrett, of which this album compares to (sort of). If there's a problem here, it's the lack of diversity. 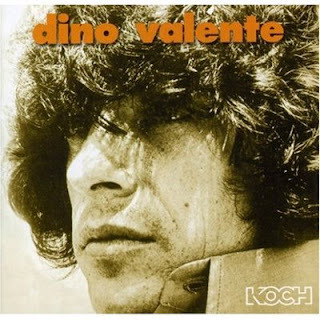 Valente's voice isn't bad, but he seems pretty incapable of any kind of range or modulation. He does sound fully involved though, so we'll give him a past. Most of the tracks are ornamented simply with a reverb-laced acoustic guitar and a bit of spare instrumentation that's also been blasted through an echo chamber. When we finally get some orchestration on "My Friend," it's like a light shining through the clouds and manages to creep into Tim Buckley territory. Other highlights here are the sprawling, epic "Children of the Sun," and the opening track, "Time." "Me and My Uncle" is an enjoyable rendition of that grammatically incorrect standard. I also have an affinity for the strange and experimental "Test," although it's pretty atypical for the album. This is a decent release with some solid songwriting. The sound here exists in a pretty thin range. If that range happens to push the right buttons, you may rate this as a buried classic. The rest of us will likely get one or three spins out of this before heading out for new sonic horizons.